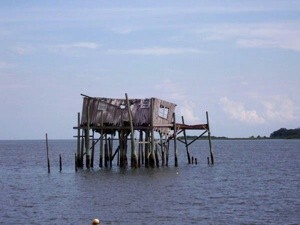 This was taken at Cedar Keys in Florida. I wonder what it used to be. It was used for fishing. In my country people build that kind of things on rivers and in the sea (close to the shore) too. They use to refurbish with what is needed to fish and for cooking, very raw to be honest! And people just cook immediately what they fish from the sea to the pan! Of course being made with poor and temporary materials and in a corrosive place it does decay after some time. The picture you took is 'what is left'. Neat to look at and imagine what it was.